Dr. de los Reyes is a Professor of Civil, Construction, and Environmental Engineering, Associate Faculty of Microbiology, and Training Faculty of Biotechnology at North Carolina State University. In 2013, he was named a University Faculty Scholar. He teaches undergraduate and graduate classes on wastewater treatment plant design, environmental biotechnology and microbiology, fundamentals of environmental engineering, and water and sanitation for developing countries. He has conducted workshops for wastewater treatment plant operators and professionals in the US and the Philippines. He has also worked in water and sanitation issues in developing countries, and has collaborations in the Philippines, India, China, South Africa, Belgium, and Malawi. He is a TED Fellow (www.ted.com), and his TED talk on sanitation has been viewed over 750,000 times. 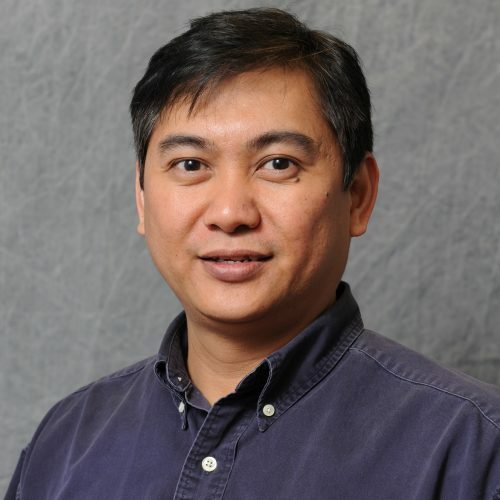 He has received the Gordon Fair Award in Environmental Engineering Education, the Outstanding Teacher, Outstanding Extension, and Global Outreach Awards from NC State, and is a Balik-Scientist awardee of the Philippine Government. He was named Outstanding Alumnus of the University of the Philippines, Outstanding Young Alumnus of Iowa State University, and Outstanding Alumnus of Phil. Science HS. He has received the US National Science Foundation CAREER Award. His students have won state (NC AWWA/WEA), national (WEF, AAEE) and international (IWA) awards for research presentations and posters. Current and past research projects include: molecular analysis and modeling of the competition between filaments and floc-formers in activated sludge, ecophysiology of nitrifiers and denitrifiers in microbial floc, N removal from swine waste, fate of bioagents in landfills, microbial characterization of landfills, molecular techniques for groundwater remediation sites, foam control methods, factors affecting fats, oils, and grease deposits in sewers, wastewater treatment for rural areas, water reuse systems, novel molecular techniques for detecting denitrifiers, energy from co-digestion, and solving pit latrine emptying problems. Dr. de los Reyes is on the editorial board of Phil. Science Letters, and has served on the editorial boards of Water Research and J. of Environ. Eng.. He is a Past President of the Philippine-American Academy of Scientists and Engineers. He has been a consultant for industry, engineering firms, and public utilities on activated sludge operation, solids separation problems, sanitation technologies, and molecular microbiology techniques. Dr. de los Reyes' research focuses on biological processes and combines modeling, bioreactor experiments, and molecular microbial ecology tools in addressing fundamental and practical issues in environmental biotechnology and environmental engineering. Another research focus is sanitation in developing countries. He is interested in two main areas: the interface between microbial ecology and environmental engineering, and global sanitation. At the ecology-engineering interface, molecular techniques are utilized as powerful tools for the analysis of microbial populations in engineered and natural treatment systems. Environmental process engineering is approached from a fundamental standpoint, combining the insights from molecular (DNA- and RNA-based) approaches with innovative process experiments and modeling. In global water, sanitation, and hygiene (WaSH), improving the technologies along the entire sanitation chain is the main focus. His team has developed a new technology for safely and hygienically emptying pit latrines in Africa and Asia. His recent research includes structure-function studies in wastewater treatment systems, landfills, soils, and decentralized sanitation systems. Anaerobic digestion (AD) or co-digestion of food waste provides the dual benefits of enabling the sustainable production of energy while providing an alternative disposal option for these ubiquitous wastes. The key to economically feasible AD of food wastes is maintaining high and stable methane yields under various loading and substrate conditions. However, the interactions between substrate variability (different food wastes, loading) and microbial community adaptations are not known, even though these directly impact process resilience and resistance. This is an important issue in full scale operation, since the collected food waste can vary in type, strength, and characteristics on a seasonal, daily, or per load basis. The overall objective of this project is to understand substrate-community interactions to optimize anaerobic digestion of food waste, particularly to increase process resilience and resistance to varying waste types and loads. This will lead to operational procedures that can be used in full-scale implementation of AD of food wastes by municipal utilities and industry. Our overall aim is to develop a simple, activity-based fluorescent labeling approach for selectively quantifying metabolically active ammonia-oxidizing bacteria (AOB) and archaea (AOA) in complex soil microbial communities. These specialized microorganisms obtain all of their energy from the oxidation of ammonia (NH3) and initiate this process through the activity of ammonia monooxygenase (AMO). Collectively, these microorganisms can have large impacts on the fertilizer applications to soils and can substantially decrease fertilizer N availability to crop plants. A simple and reliable method that can predict in situ rates of AMO activity in AOA and AOB could be a useful management tool that could help decrease fertilizer waste and environmental impacts of excess fertilizer applications. In the continuing quest to relate microbial communities in bioreactors to function and environmental and operational conditions, engineers and biotechnologists have adopted the latest molecular and â€˜omic methods. Despite the large amounts of data generated, gaining mechanistic insights and using the data for predictive and practical purposes is still a huge challenge. This project will use a methodological framework to guide experimental design to improve the operation, start-up, and resilience and resistance of anaerobic bioreactors co-digesting food and FOG wastes. This research represents leading edge work to combine molecular microbial methods, bioreactor experiments, and modeling to identify and exploit the underlying factors that govern microbial community assembly in anaerobic co-digestion systems. Approximately 3.3 million North Carolinians (35% of the population) rely on private wells as their primary source of drinking water.1 Well water quality is not regulated at the state or federal level, despite several studies illustrating a link between well water contamination and adverse health outcomes.2,3 Moreover, well water can contain harmful organic contaminants such as pesticides, but occurrence data are sparse.4 Key goals of the proposed research are to characterize pesticide contamination in private well water across the state and develop information for the selection of effective home treatment devices. Our current WRRI-funded research (ending June 2014) has shown the potential of anaerobic co-digestion of GIW with wastewater-derived biosolids as a value-added disposal option. Our research resulted in several key findings4,5: 1) We achieved the highest methane yield ever reported for co-digestion (0.785 L CH4/g VS added, representing a 336% increase over the baseline). 2) We showed that step feeding as a strategy allows up to 75% (w/w) of volatile solids (VS) without overloading. 3) We demonstrated that high load pulses increased the digester resistance to GIW overloading. 4) Molecular microbial analysis using next generation sequencing is ongoing, but our pulse experiments suggest that changes in acid oxidizing bacterial communities are key. These results directly impact the economic feasibility of operating GIW co-digesters, specifically with respect to maintaining high methane yields. The overall objective of this project is to understand substrate-community interactions to optimize anaerobic co-digestion, particularly to minimize start-up time, and increase process resilience and resistance. The specific objectives are to: (1) Determine the key microbial populations that limit the anaerobic pathway to methane under different stress conditions such as overloading and GIW variability, (2) Influence these populations through active adaptation, and (3) Develop a procedure for producing a high yield yet resilient anaerobic co-digestion system that can be used in full scale applications. North Carolina has a tremendous need for efficiently treating high-strength waste streams. These include agricultural residuals, food wastes, and wastewater-derived biosolids. Anaerobic digestion is one promising treatment and energy recovery method, but several limitations prevent widespread adoption. One of which is the instability that can arise from disruptions between key groups of microorganisms and another is the incomplete conversion of organics to methane gas (CH4). To overcome these limitations, we propose augmenting anaerobic digesters with electrically conductive micro-scale particles. These particles have proven effective as conduits for microbe-to-microbe direct electron transfer, resulting in improved rates of CH4 generation using pure strains in the lab. We hypothesize that supplementing anaerobic digesters with these particles will improve stability and CH4 recovery by strengthening interspecies electron transfer between the two central microbial communities: syntrophic bacteria and the methane-generating methanogens. Our objectives are to (1) determine the impact of various particle properties (type, conductivity, size) on organics removal and CH4 generation, (2) determine optimal particle loading densities for two distinct waste streams, and (3) assess the settleability of particle-augmented waste. To do this, we will operate lab-scale anaerobic digesters with and without conductive particles (activated carbon, magnetite, biochar). These findings will be especially beneficial for wastewater treatment facilities and farmers around the state looking for strategies to tip the economics in favor of anaerobic digestion technology while ensuring the health of our water resources. A workshop on microbial ecosystem services conducted with WUSL, Univ. of Maryland, and UC Merced.